dance.net - Wondering what programs/software are good for designing solo dresses? (10170969) - Read article: Ballet, Jazz, Modern, Hip Hop, Tap, Irish, Disco, Twirling, Cheer: Photos, Chat, Games, Jobs, Events! Hello, I am a new member! I am very very interested in designing solo dresses, and have done so for a while, although just by drawing out on paper. I designed one of my solo dresses and it was made by Shamrock Stitchery and I absolutely loved it! I'm wondering if there are any software programs out there that people use to design solo dresses on their computers or tablets? 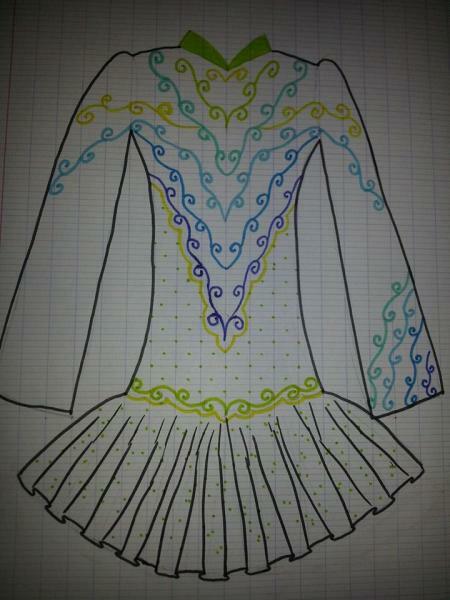 I have seen a number of them in dress design competitions that are clearly made on a program, and of course professional dress makers must use computer designing as well. Does anyone have any suggestions? 11 Replies to Wondering what programs/software are good for designing solo dresses? 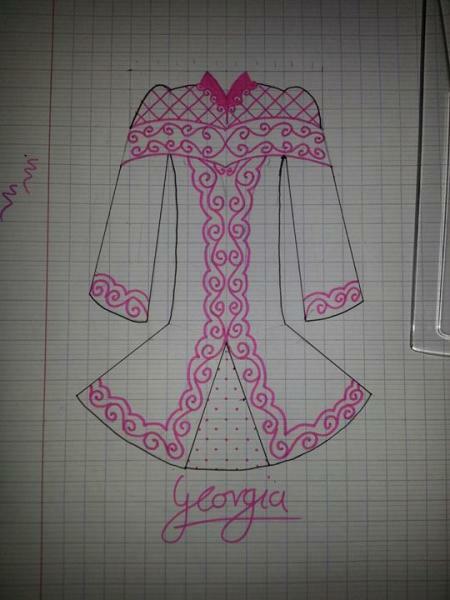 I also design dresses, though I do it digitally. Adobe Photoshop is a great program for drawing, as is Adobe Illustrator, however here are the major differences. Photoshop is a pixel-based program. That means, if you take something that you've drawn in photoshop (and lets say its small in size- 8.5 by 11 inches *the size of computer paper*) and you want to make it larger (lets say 18 by 24 inches), or up the initial size of the file, etc, the drawing will look pixelated and stretched. Illustrator is a vector program - which means it uses mathematics to illustrate lines. It's tricky to use, but once you get the hang of it, it's wonderful. Most logos for large-scale companies are designed in Illustrator. The great thing about illustrator is that you can morph and free-transform just about anything without it getting pixelated and warped. The downfall of these programs each- they're expensive. Worth the price if you're serious about designing, but for casual designing, it may or not be worth it. 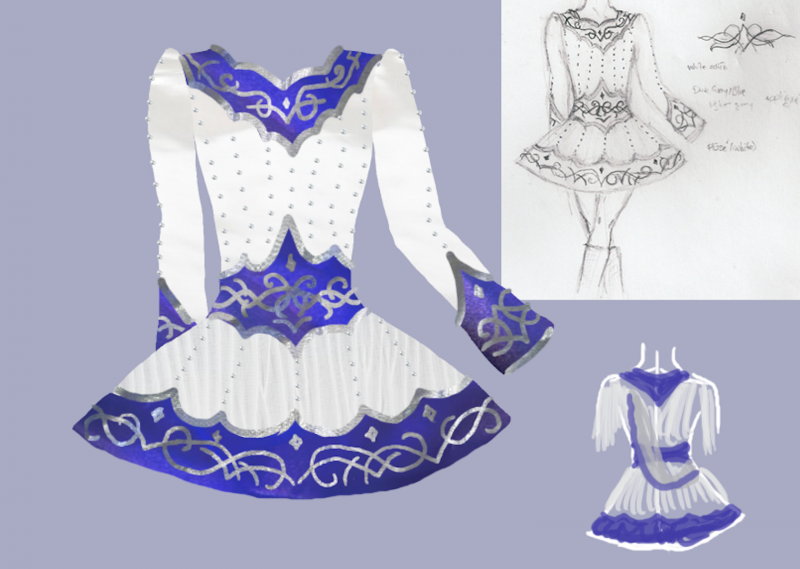 The thing with designing costumes is that unless you've digitized the designs for embroidery (something that most dressmakers will do after they've not only obtained the measurements of a dancer, but after they've sketched out the basic design of the dress- i'm not too sure about the exact process of it though), you're basically just sketching designs. I'm assuming that this is what you want to do - make beautiful drawings of dresses so that they're clear and crisp and easy to read. With all that in mind, if you don't want to go the adobe route, there's a wonderful program called Sketchbook Pro. It's also a pixel based program like Photoshop, but it's MUCH simpler to use!!!! I SWEAR by this program and do just about all my designs in sketchbook pro unless I seriously require major tweaking and morphing for things like intricate knots that I've already sketched out (in which I use Illustrator). I know Skethcbook (which is an Autodesk program) has an "express" version which I think is either free or fairly cheap. Sketchbook Pro is about $60 and is downloadable through the apple ap store if you run mac (i'm sure you can find it through the autodesk website if you run windows). Regardless of programs, the biggest thing that makes all the difference is having a drawing tablet - I'm currently a student at an art and design school, so i'm drawing everyday on the computer, so the tablet I have is EXTREMELY pricey - $700 to be exact. There are much cheaper tablets out there. The best tablet for a good price is the Wacom Bamboo. It's running for about $130 which is a fair price if you're going to use it often. Below is a link to amazon which has great prices for tablets. It's expensive, and quite an investment, but well worth it if you're serious about designing. 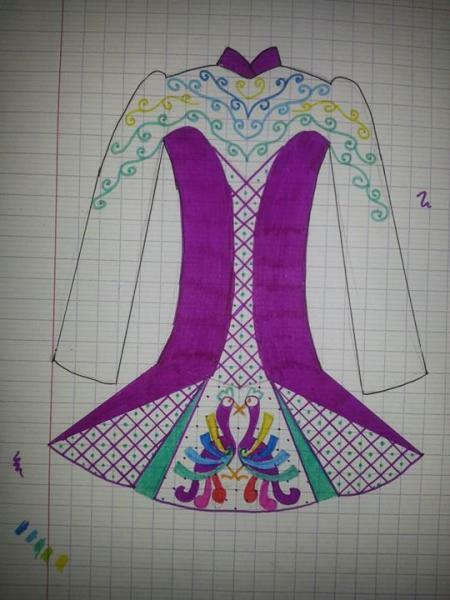 If your designs are good enough, you might even catch the attention of a dressmaker who'd want to work with you! I got lucky in that way, and now i'm working with KDSF and so incredibly happy with where I'm at, design-wise. 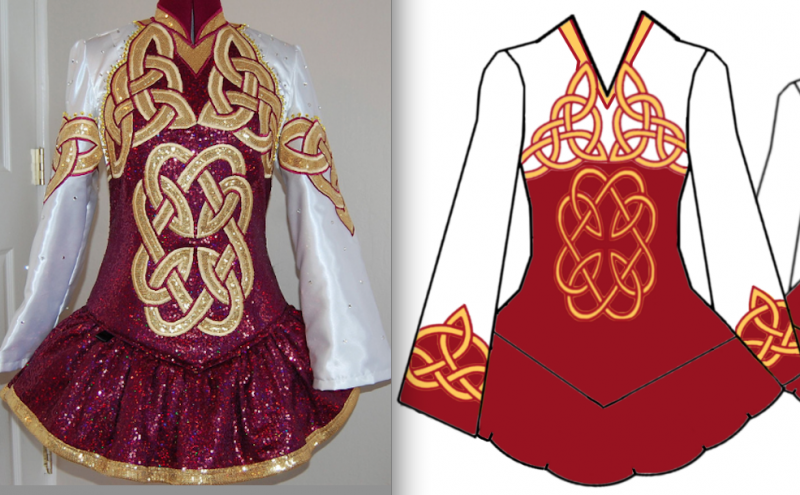 I've attached a photo of a design I did for a dancer, and the finished product - it's exciting to see designs that you've created fabricated into reality! But you can see that design which was created in Sketchbook Pro - it's fairly clean - a lot cleaner than it could be on paper. I hope this helps a bit! All the best and greatest luck!!!! 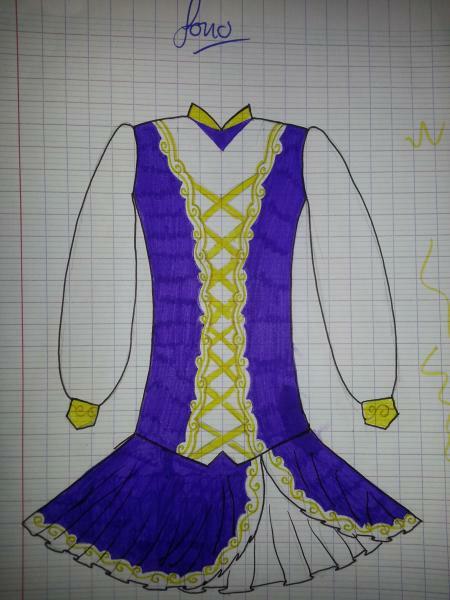 Disclaimer- that dress belongs to another dancer, and it is not for sale. Dress created by KDSF, photo credit to KDSF. re: Wondering what programs/software are good for designing solo dresses? Wow this is great thank you so much! I was wondering though, the part I have the most trouble with is making Celtic knots and designs, how did you do them so perfectly on your design? Is that something one on the programs can do well? Sorry that I know nothing about graphic design! 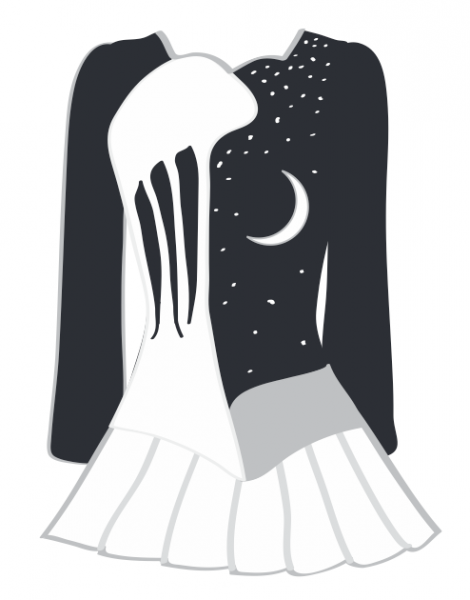 ^For the most part, i tend to design my dresses in halves - that is, for a symmetrical design, I create one "side" of it and then duplicate the layer (layers are your best friend) and then mirror it (you can typically find that in the image drop down). For that specific design, the dancer approached us with that knot. But in general, I tend to stick with simpler knots and I'll draw from images of traditional celtic knots (ones that you would find in the book of keels), or just mess around and play with basic knots such as a trinity or a 4-way knot. It's really a trial and error sort of thing, but the best thing to do is to envision a dress and know what you want to design and then put it down as best you can on paper/on a file. My knots at first were HORRIBLE! in fact, I used to avoid them. But you get better with them as time goes on and you keep drawing them. The key is symmetry though. 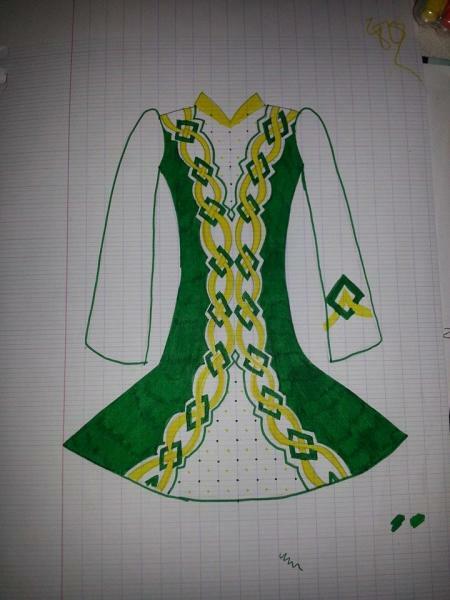 If you google Celtic knot images, you can find many designs which are available to copy for free. Use them as-is or modify them. Do not copy the protected designs without the artist's permission. I second saoirse3473 on Photoshop. I love it! Despite a steep-ish learning curve, it is very powerful and can do just about anything you could possibly imagine. 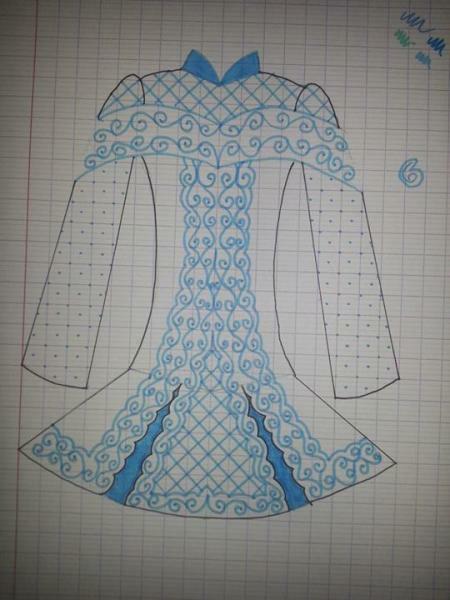 I use the pen tool for scrollwork and knotwork when designing dresses. It helps me draw very clean curves and makes "paths" which are very easy to manipulate later if I need to tweak them. This is also something Adobe Illustrator does very well. I still prefer photoshop, though. While photoshop is pretty expensive, there's a watered-down version called Photoshop Elements 2.0. I used this through school and I found it did a lot of the things I needed it to. It's a very old version, but a little hunting and you may be able to find it still. There's also GIMP. I've never used it, but a lot of my friends in school used it because it's free and supposedly works a lot like photoshop. If you google it, you can probably find the GIMP website. I'd say definitely invest in a tablet. I have an ancient Wacom Intuos 3 that is still kicking after 8 years of heavy abuse! Best money I've ever spent! Drawing with a mouse is like trying to paint a masterpiece with oven mitts on. Very frustrating. I hope any of these programs work for you! There are always free trials to download and try out. That way you can get a feel for what works best for you. Good luck! You're a concept artist?! That's SO cool! I'm in a digital media department at my school and everyone around here is a concept artist (which, I am no where near capable of being- I can't render things out like you guys can!) and it makes me slightly jealous lol. I just want to add even further that I also use the intuos tablet and they are extremely well worth the money - I just want to add that if you do splurge on a tablet, I'd recommend ordering some cardboard tips (they'll have them on the website i'm sure). Plastic tips will run down your tablet faster (though, as mentioned before, these babies last a while). The plastic tips are preferable for cintiques, but they'll mark up and run down your tablet. You'll burn up the cardboard tips quickly, but good news is they're cheap to buy. I'd also recommend finding or creating a nice template to use and re-use. It just helps if you have several skirt templates (based on current trends), collar templates, and the bodice and sleeve shapes are to remain the same. I learned this one late in the game, and it saved me SO many hours of work. I always used Photoshop for design work until I started doing professional graphic design work, and now I swear by Illustrator. 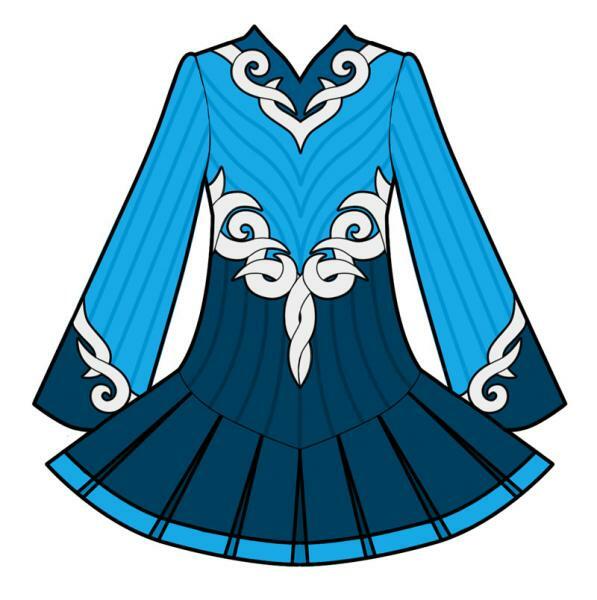 It's much easier to do digitizing work on the dresses to get them to the creation phase when working with vector-based programs (as Soairse said so eloquently above), not to mention that the clean lines and tracing abilities you have in that program make it worth the cost. Kefling is MUCH better at getting clean Photoshop lines than I am, as you can see!! I rely on Illustrator for that. As for the tablets, I agree wholeheartedly. I have the Wacom Bamboo and (though it's somewhat old), it works for me. Moving to a tablet gave me such better control over the thickness of the lines, the gestures, and editing ability. If you do choose to get Adobe, the newest programs have moved to a subscription format, which means your programs will always be up-to-date, but will also cost around $80/year. I would also recommend sitting through some tutorials to get used to the very technical environment. Now, I tend to use Photoshop to get an idea of how the fabrics and crystals would look together (photo 1), and Illustrator to actual get the designs figured out (photo 2-ignore where I clearly got lazy). 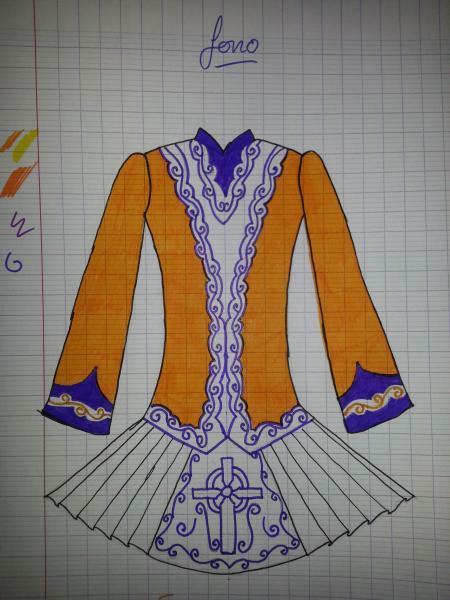 I love designing costumes too. I have never tried on a computer or anything, I personally hand draw mine, I'm not good at all with knotwork as you can see by some of the examples I posted here, but I feel that sometimes its much easier to draw them on paper. just the cardboard nibs. Granted my tablet is relatively new, so it's in pretty perfect condition. But a friend of mine has had her tablet for 5 years now, and she's only used the cardboard nibs on it and it's PERFECTION - not a single scratch. I was unaware that you could buy a protection surface for it - I would imagine that they would get in the way of the accuracy of the tablet (you know how like some iPhone or iPads have the plastic cover over them from the case and it's harder to type with them because of it?). Major Kudos to reelgirl343 for doing that in illustrator! I love illustrator, but I'm still in that "i'm not sure if i hate you or love you" stage with the whole program. There is an auto-trace button with it so you can trace your drawings that you've scanned. Also, if you do go the illustrator route, try doing everything with the pen tool - it will give you extremely clean lines and you'll have perfect control over them.